Contents: Mobile Command Centre with cab, police motorbike, crooks’ ATV, 4x minifigures plus a police dog figure, and accessory elements. Take the police force out in the field with the LEGO 60139 City Police Mobile Command Centre. With a monitor room featuring screens and a satellite dish, a jail cell and detachable cab, the Mobile Command Centre should have everything the 2 police minifigures need at the scene of the crime. But watch out! The crook is using his ATV to break open the jail cell, setting his partner in crime free. With the jail cell breakout feature, the crook can attach the hook and chain to the jail door bars and hit the gas on the ATV to break open the door. 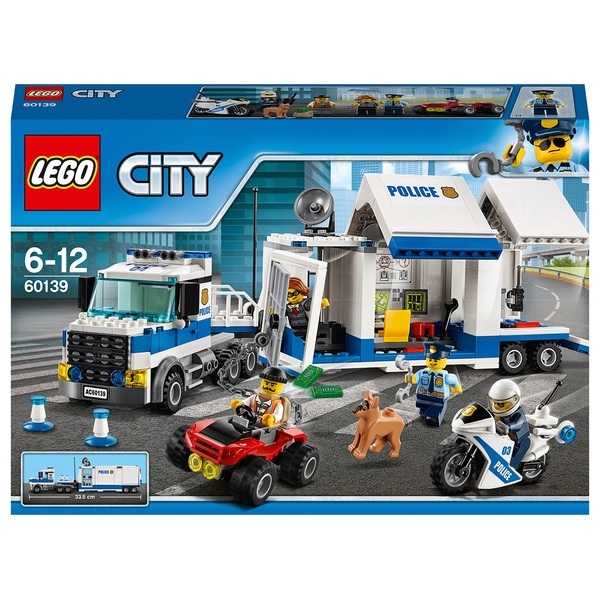 The LEGO 60139 City Police Mobile Command Centre comes with a police dog and a police motorbike, so the 2 police officer minifigures can track down the fleeing crooks in no time. Lower the back ramp of the Mobile Command Centre to unload the police motorbike, then race after the crooks and bring them to justice! The LEGO 60139 City Police Mobile Command Centre has a desk, seat, mug, walkie-talkie and set of handcuffs for the police officers, a well as a backpack and 2 money bills for the crooks and cones, a wrench and a lollypop stop sign to set the scene.